Hello my lovelies! Sorry for the lack of posts lately but it seems that time is not my friend these days. Today I'm starting a new and exciting challenge, one that I hope to be able to take part in at least a few times. I'm not sure if I'll have a lot of time in the following months, but this is a weekly challenge and you can choose to participate each Saturday depending on your time and inspiration. It was created by the lovely Georgia for The Polish Addict Facebook group. The themes are very creative (you can see them all at the end of this post), so they are not all easy. The first one was sort of complicated because we had to get inspired by pop art. According to Wikipedia, pop art is a movement that started in the 1950s and its concept was to include imagery from popular culture into art objects. I didn't want to paint a can of soup on my nails, so I chose to get inspired by Andy Warhol's Marilyn Monroe prints. I kept it simple and went with stamping. Hello my lovelies! Do you ever live under the impression that there's not enough time in the day to do everything you wanna do? That's what I've been experiencing in the last few weeks. I have to study and that leaves me very little free time and I would like to do so much more in that time. Like for instance this post was meant to be written last night but it somehow didn't. Or the fact that I wanna answer comments on my posts a lot faster, but before I know it a week's worth of comments have piled up unanswered. So if you have a solution for my problem I would really appreciate it. Enough with the blabber, today I'm showing you another untried. The theme for this week was "creme", it really doesn't get easier than that. Hello my lovelies! I won't even talk about how bummed I am that it's Monday today. I have some blue for you but this time my story is a bit of a fail. I didn't have a very good nail week last week and I really hope my luck will improve soon. The polish I'm showing you today is from Essie and it was on my wishlist for a very long time. I finally found it for a very low price on Fragrance Direct so it immediately fell into my cart. Unfortunately there must be something wrong with my bottle because it's been a total fail. In theory it looks like this. Hello my lovelies! I hope you are enjoying the weekend and the weather is great where you are. I have a very exciting post to share today. It's kinda like a Secret Santa we did in our group The Polish Addict on Facebook, only instead of gifts we are doing a manicure inspired by the person who was assigned to us. My secret person is the lovely Agota over at Nail Glaze. It was very exciting because besides the fact that she has a ton of amazing nail art on her blog (very hard for me to choose just one as inspiration), Agota and I live in the same city. How cool is that? So after browsing and browsing on her blog, I decided to pick a blue manicure (obviously), namely a blue gradient that you can find here. Here's how mine turned out. Hello my lovelies! It's Friday! I can't wait for the weekend cause I'm supposed to get a new phone tomorrow and I can't wait to play with it. Today I have a very fun glitter for you and I created two different looks to show you how versatile it can be. It's one of those glitters that can look both elegant and fun depending on the way you layer it. The name immediately made me think of the lovely Elsa over at Like a candy shop. I really hope she likes this polish! Hello my lovelies! I woke up this morning to a very cloudy and rainy weather. I sure hope fall isn't already here because that would make me very sad. Today's theme for the untrieds challenge was a very easy one, namely glitter. I initially wanted to post one from Shimmer polish but I pushed that post to Friday so I can show this Flormar glitter first because everyone was very curious about it. A few days ago I went out and got two more of the Glitter collection polishes (the first one I've shown here) and I'm showing the one with square glitter today. Yes, Flormar is doing square glitter now! Hello my lovelies! Can you believe it's Monday again? I sure can't! But since we have to go back to work I should at least show you an amazing blue. I'm so happy to post the one from today. It's been on top of my wishlist since forever and I had lost all hope to ever own it like I've told you in this post. But then I had the immense luck to find it on a discount website called Fragrance Direct. I couldn't believe my eyes! One week later and it was all mine. Hello my lovelies and happy Sunday! I wanted to get this post up earlier but I got attacked by a huge headache last night and it was still there in the morning. So finally, after more than 12 hours, it's gone and I can think straight again. Today I will be showing you a gradient. The thing with these is that I'm not that good at making them and every time I do one I end up not liking it too much. I went on a gradient spree last week and created a bunch of these, so you'll be seeing them in my next posts. The first one is green. Hello lovelies! Today's post is a very special one because it's post number 500 on my blog! Isn't that exciting? I must confess that I have no idea how I got to this huge number. I guess if you love doing something time flies and you end up almost 2 years later with no idea how you got there. I would like to thank you all for following me and for stopping by my little blog every once in a while. It means a lot to me that you support my passion! I thought about doing something special for today's post, but I decided to do what I love most and what I initially started this blog for: swatching and reviewing polish. The one from today is a beauty and it has rapidly become popular around here because it seems to be a dupe for Zoya Storm. Here's what I'm talking about. Hello my lovelies! How is your week so far? I'm studying like crazy and it's only the second week since I started it so I've got over one month to go. I'm already tired and I'm running out of patience. I don't even have the patience to do nails and that's partially why today's manicure is less than perfect. This week's untried theme was "in season", so I had to choose something very summery. Naturally, I went with a neon polish. This polish is the only neon yellow that I own and it was sitting in my untrieds for quite a while. Hello my lovelies! It's Sunday night as I'm writing this and I'm very tired so I apologize in advance if my post is a little weird. The blue I'm showing you today is amazing and really deserves some better writing skills from my part. It came to me as an incredibly kind gift from Hannah and I really wasn't expecting the awesomeness that this polish is in person. Be prepared for a ton of pictures of this beauty because it was really hard to choose just a few. Hello my lovelies and happy Sunday! As promised yesterday, I'm back with some nail art and a tutorial. I posted this colorful paisley manicure a few months ago an I finally decided to recreate it and also do a tutorial because a lot of people liked it and I thought it might be useful for some of you. It also fits today's Adventures In Stamping theme which is stamping with 2 or more colors. Hello my lovelies! It's Saturday and I have some nail art for you, as promised. These nails are from a couple of weeks ago, but I still have a lot of older stuff to post and I'm trying to catch up. I have no idea what I had in mind when I created these. All I know is that I wanted them very colorful and I think I totally reached my goal. Hello my lovelies! Just a quick post today to show you an older manicure that has been sitting in my vault for a long while. I really can't remember when I wore these nails but it must have been over a month ago. They are perfect for summer and for the weekend so I decided to post them today. Hello my lovelies! It's Wednesday and that means I have an untried for you. Today's theme was "prettiest" and naturally it was an easy one. I just had to pick my prettiest untried. These swatches are a little older but I've saved them for today's theme because there's nothing prettier in the nail polish world than Aurora. Hello my lovelies! I'm back to my normal routine and since it's Monday I will be sending some blue your way. I have a gorgeous glitter polish to show you today. It's not entirely blue but it has a lot of blue glitter in it and I also layered it over a blue base. Take a look! Hello my lovelies! Today I have another Born Pretty Store review for you. I've been meaning to try their water decals for a long time and I finally received some for review. I have a previous experience with water decals and know that they are pretty easy to work with, but I haven't tried the ones they sell. 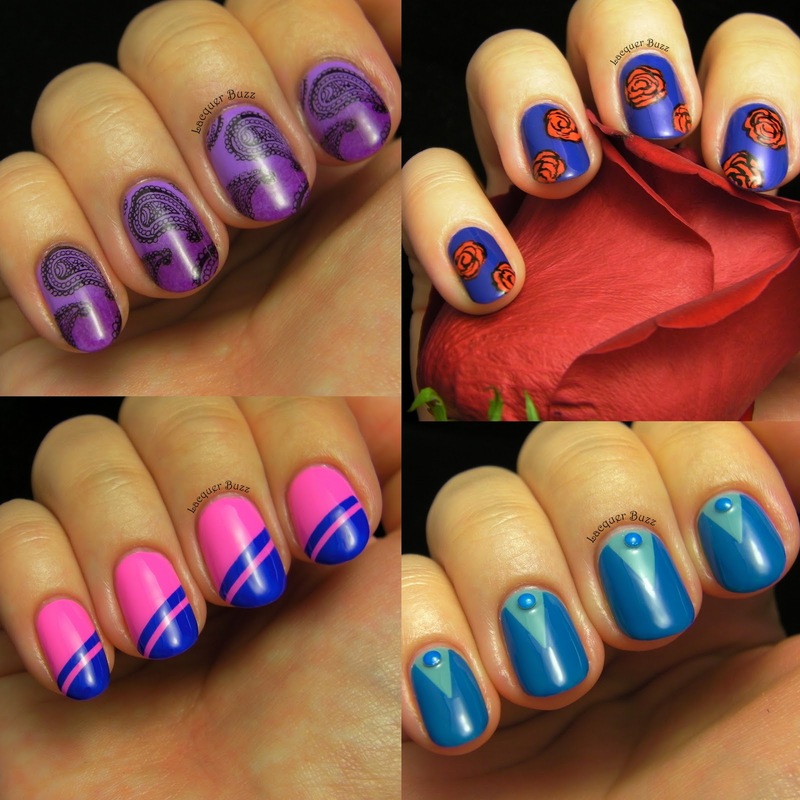 The ones I picked out are full nail designs and they look like this.